The DC-3 plane transporting us from Inuvik to Sachs Harbour. Photo by B. Gasser. The first batch of scientists onboard the DC-3 from Inuvik to Sachs Harbour. Photo taken by E. Leymarie. 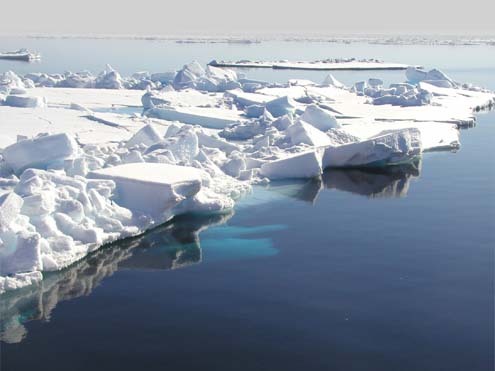 First look at the CCGS Amundsen. Photo by D. Vaulot. 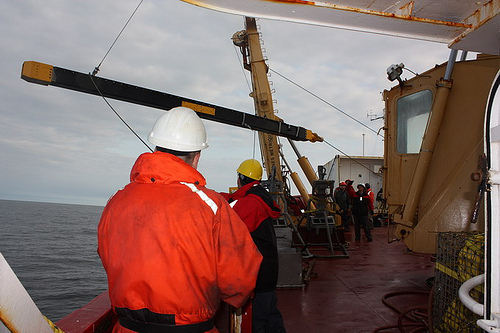 Retrieval of the Casque corer. Photo by D. Vaulot. 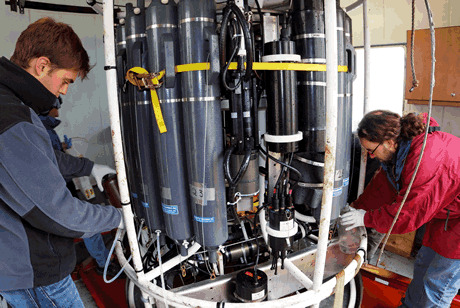 First look at the sediment core collected with the Casque corer. Photo by E. Leymarie. The Casque corer filled with sediment. Photo by E. Leymarie. The CTD-Rosette equilibrating just below the surface before the start of a cast. Photo by Jacobo Martin. Getting ready to retrieve the CTD-Rosette. Photo by Jacobo Martin. 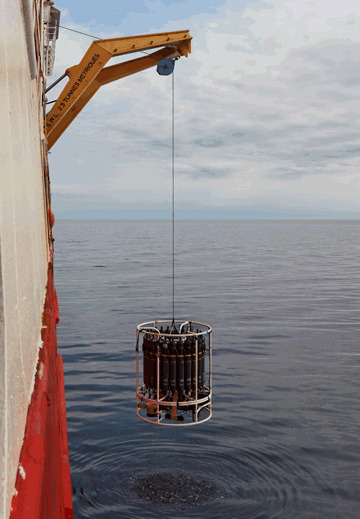 Retrieval of the CTD-Rosette. Photo by D. Vaulot. Water sample collection from the Rosettes 12L Niskin bottles. The optical instruments seen in the foreground include an AC-9, BB-9 and a LISST. Photo by D. Vaulot. 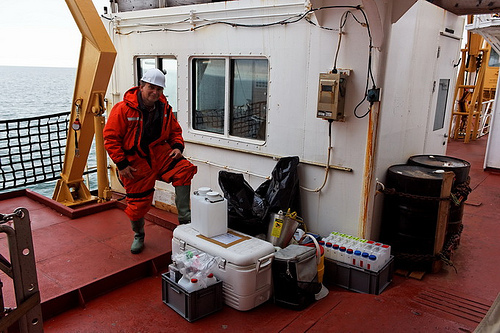 Daniel Vaulot getting ready for Zodiac sampling of the Mackenzie plume. 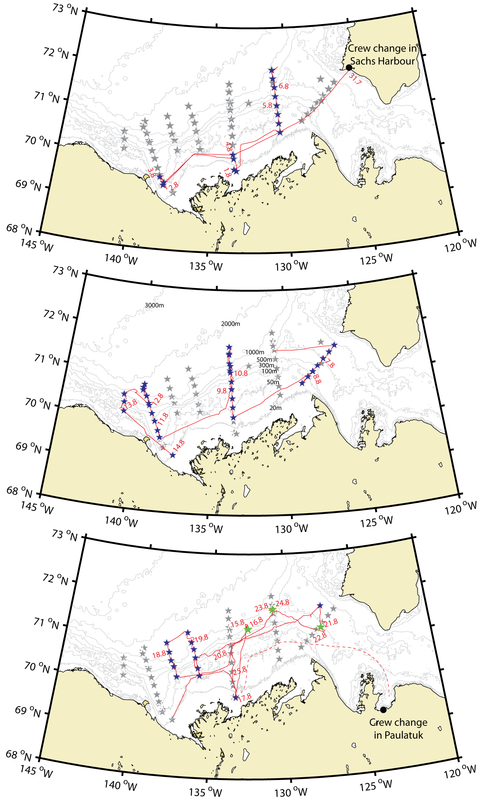 The Zodiac returning from the sampling in Kugmallit Bay. Photo by J. Ehn. The Barge returning from the sampling in Kugmallit Bay. Photo by B. Gasser. AOPs profile being measured. Photo from helicopter by D. Vaulot. Profile measurements of the 3D radiation field. Photo by V. Wright. David Doxaran next to the IOPs frames. Photo by V. Wright. Deployment of the IOPs frame. Photo by J. Ehn. David Antoine deploying the C-OPS profiler. Photo by V. Wright. The incident irradiance used as a reference were collected with instruments attached to a telescoping mast that could be raised above any structure on the Barge. Photo by E. Leymarie. Filtration for suspended particular matter (SPM) and particulate organic carbon (POC). Photo by E. Leymarie. Spectral absorption measurements of particulate matter collected onto a glass fiber filter. Photo by E. Leymarie. Spectral absorption of colored dissolved organic matter measured with a WPI UltraPath spectrophotometer (up to 2m optical path length). Photo by E. Leymarie.